Green chillies : 4 to 5 nos. Cook one fourth Kg. 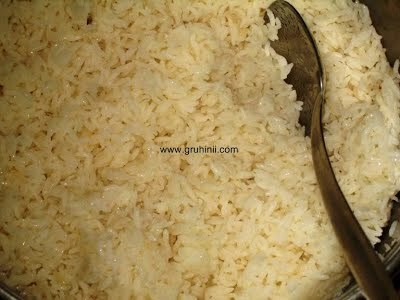 rice seperately in a pressure cooker and let it cool. Heat 3 table spoons of oil in a pan. 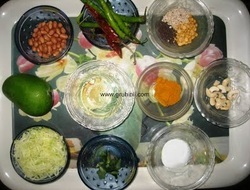 Add Rai to it and when rai splutters and udat dal, chana dal, groundnuts, kaaju and curry leaves. Fry until golden brown. 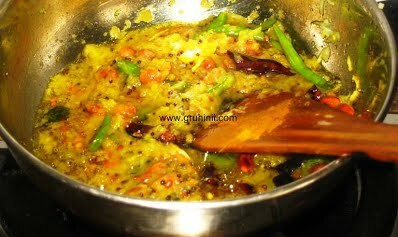 Add green chillies, Red chillies,and hing stir, add grated mango. To it add salt and haldi. Lower the flame cook until the ingredients leave oil. Switch of the flame and mix it to the cooked rice.